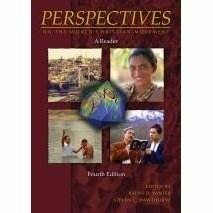 The following articles I had read and written some short thoughts down all came from Perspectives on the World Christian Movement : A Reader by Ralph D. Winter (4th Edition). How was this article helpful? I ever enjoyed the fact that the article was focused solely on one specific area in dealing with the apostles mission. I like even more how the author relayed their mission coming out of the Jewish faith. Does this article change the way you think about this subject? Made me think that the apostles, namely Paul all had to suffer in missions for the sake of God’s name. Also, I found it interesting that he saw an importance in Paul’s teaching before he became a believer in how that got him ready for his missions work. How was this article helpful? Was helpful to me seeing the importance looking at the meaning of the Kingdom is to the mission of the Old Testament, King, and to what authority it is by. I also liked his focus on the peoples part and their role in the mission of the Kingdom. His Gospel-centered view on the kingdom and bringing both roles together seems to be right were I am in Biblical Theology of Missions. I also enjoyed his asking of questions, and answering them – makes an easy read. What was confusing or questionable? I can see how an article like this could be somewhat confusing and not understanding to the typical Amil. Reformed circles. Does this article change the way you think about this subject? I enjoyed near his ending in how the role of the believer is then realistically played out in their everyday life. How was this article helpful? His distinction between Kingdom and Church is good in that he spends his time explaining the church’s role in the Kingdom. Even more in that they are worker’s of the Kingdom both today and that in the future. What was confusing or questionable? He seems to have only believe that “orthodox christians” will inherit the kingdom of God? Really!? Does this article change the way you think about this subject? It is ever grateful to dwell upon that the New Testament Church is not plan “B” but yet is part of the wonderful mission that God has done for his people. How was this article helpful? Verkuyl does a good job in describing God’s motif being universal, giving Scriptural support (Gen. 10) to all the nations for His mission. What was confusing or questionable? I think his view of the Kingdom in the later of the article is not where I am at. Not so sure that the whole arrival of it is here, sorry. Matter of fact the whole later section I think he may have mixed a little too much biblical theology of Kingdom with the biblical theology of mission. All though there are some overlap, not as much as I see here in his article. Does this article change the way you think about this subject? He does spend some time in the bringing arguing in how many do not spend enough time in the Old Testament having no missional mandate. While I agree in some aspect I think he should direct this back towards Dispensationalism. How was this article helpful? Scott’s section on the model in which the believer has in evangelism today was great. Great in that we speak with the same Word in which God and the apostles use in both the Old and New Testaments, God’s inspired Word. What was confusing or questionable? I know this will start a fight, but does the Bible really give us a Biblical Mandate to all in the church for missions or even for evangelizing? Does this article change the way you think about this subject? I did like his point in saying that Bible mandate to which one is to look at, practice and get their mission is from Genesis to Revelation, not only the New Testament church, but see both Testaments. How was this article helpful? Seeing the fulfillment of Abraham’s mission to the nations is extremely important in being apart of one’s theology of mission because with many today only looking at the “mission of the New Testament church, they forget in how the covenant is fulfilled with the gentiles coming to Christ. Once that context is set, then one can practice biblical missions practically along side the mission of God throughout all of history and not only the New Testament. What was confusing or questionable? The christian Mission really starts at Abraham? You are telling me that Noah’s, Adam’s and Job’s mission is not the ground to start on? Does this article change the way you think about this subject? I do see Dr. Scott’s importance in understanding Abraham’s call to the nations. I most enjoyed that the flow of history has purpose and plan in the mission of God for all his people. How was this article helpful? Bosch’s article was helpful in how he related the “Great Commission” in Matt 28:18-20 along side of the mission of witness in Acts 1:8. Near the end I also enjoyed his reasoning behind the silence for the “Great Commission” during the early church. I also liked how he showed that the Old Testament mission was different but yet not contradicting the mission of that in the Old. What was confusing or questionable? The most confusing part in Bosch’s article was that how explained that the Old and New were the same but yet in how they were different… Did not fully understand how or what he was getting at in his de-fence of that the Old Testament was not only fully God’s hand. Does this article change the way you think about this subject? I did enjoy the christological approach at the end in how Christ began God’s same mission in the New Testament. How was this article helpful? This article was helpful in that it links together the prophets (Malachi) in bringing forth Christ the one who brought the mission of God to the gentiles, namely in Matthew. I enjoyed his Biblical Theology of tracing the term back throughout God’s mission in the Old Testament “Son of Man” and bringing it through the New Testament in showing it’s importance in the over arching mission of God that was always planned. How was this article helpful? Classic Piper before he was known, Piper is helpful in seeing the extreme importance of how important missions really is today. Also Piper deals with how God is in the center of missions and how the church deals with that. The whole missions is not first but God is first, so therefore missions flow out of the God. What was confusing or questionable? Pretty simple article. Does this article change the way you think about this subject? Piper like usual brings home the passion that God has for his mission of his Word being given to all the nations. Another way of seeing missions, Piper shows the importance of suffering for God’s work and the power that his work has in the lives of those who have not heard. How was this article helpful? Piper places the Word’s of Christ first in missions and that is helpful in knowing exactly what the mission of God and the church is. Also helpful was that Piper’s article in how the Word’s of Christ related to the different people groups in the New Testament. He did so by drawing the connection between Genesis 12:3 and the words for people groups and the difference that brings in dealing with missions. Even more helpful is how Piper summarizes his article in giving the application of today’s church in dealing with missions in the church. What was confusing or questionable? Confusing at times is how Piper jumps from on subject to the next, then coming back to something 3 pages later. You have to read carful being that he writes much like he speaks. Does this article change the way you think about this subject? Piper was more practical dealing with how missions works and what it looks like then a number of the theological articles I read on missions in dealing with the Kingdom. How was this article helpful? I found DeRidder helpful in that he brings forth the importance of the Old Testament and in what it deals with the theology of mission. Also was helpful in explaining that Israel purpose in doing God’s mission was for all the nations and not that of only Israel. Does this article change the way you think about this subject? How often we tend to separate the Bible into two books really hurts the over aching principle and the theology of mission. De Ridder’s section on Gen. 3 and he section on dealing with the three over aching premisses through the whole of the Bible (creation, Revelation, and Redemption) helps the reader and myself see the flow of God’s mission, who God used throughout His mission, and how that influences today’s mission in the New Testament church. How was this article helpful? Most helpful in that it laid out the importance of having a Biblical Theology of missions and not going to the church first but yet to the Scriptures. What was confusing or questionable? Maybe I am wrong, but he seems to have a solid Bible grounding on the theology of mission but yet does it circle around and have his mission develop his theology? I thought his article going through the New testament was great, but shouldn’t we look at Abraham, David, and the Prophets and what God’s mission was to use them in order to define our line of mission and theology of missions? Also his section on “Why Then Missions” pages 132-3 were a bit confusing in that I am not sure what he really believed in Jesus mission given to the apostles in Matt. 28:18-20. Does this article change the way you think about this subject? I did like the small but yet section in which he focuses on how the cross and eschatology. How was this article helpful? This article was helpful in showing that the ultimate sign of the Kingdom is found in what Christ did in his mission here on earth, namely the cross. It was also helpful in showing the giving of the Spirit to the NT-Church in aid to carry out the mission given to the peoples of God. Thus going forward then calls the church to not stand quit, but to go forth proclaiming the Gospel to all the nations. What was confusing or questionable? Pretty strait froward and short article. Does this article change the way you think about this subject? I have never thought before how Jesus had worked in his mission towards the sick since satan had hurt God’s children. Thinking of this practically today in the NT-Churches in how they should look upon those that satan himself have easily taken astray and hurt psychically so that they would be blinded are in much need of the good news of Christ Jesus, the Gospel.